Repair BKF File For Windows – Precision Guaranteed! We all depend on a backup plan when a significant data or information is involved. Similarly, your computer data can be backed up in the .bkf format which acts as a substitute for the original copy. However, repair BKF application is just a provision done for the users barred from the access of their data as well as its backup. BKF Recovery simply offers users of a wide variety with the ability to perform Windows backup recovery with precision, no compromises or limitations. Users wanting to fix corrupt MS BKF file affected by a low degree of damage/corruption or consisting of small amount of data can go for Quick Scan mode to get instant recovery results for faster extraction of the files and folders stored within. Whatever is stored within your Windows backup file is recoverable with sheer ease and guaranteed precision. The software is capable of retrieving all data types including media files like; mp3, videos, images along with documents, exe files, etc. Deep Scan is for users having the need of tackling with severe corruption issues. However, it is made sure that least possible amount of time is consumed but size of backup and intensity of corruption will have to be dealt with eventually. Ensure availability of required data files/folders within recovered backup file using the search file option. This way selective file will be searched and listed on the repair BKF tool panel from the recovery results produced by the tool after BKF scan. Doesn't matter if you have a large size backup file and lack of time; convenient services are served to all. Use Range Based Scan to only scan a percentage of data from a large backup. Set any range from 0-100% and recover rest of the data later on. To avoid scanning a backup file repeatedly in process of extracting data in small parts by saving your backup scan. With repair BKF tool it is possible to save a scan once to avoid rescanning the respective file in future for extractions purposes. 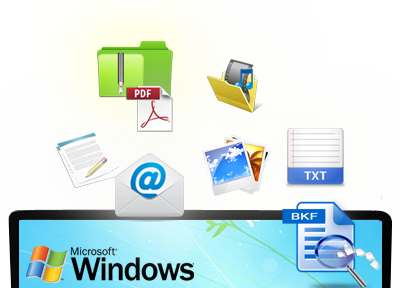 There is more to this BKF repair software than just performing Windows backup recovery. First the software offers a preview of the backup folder structure and files stored within. Instead of all backup data; one can extract selective files too. BKF file repair tool is built with powerful algorithms having the potential to repair Windows backup from lowest to highest intensity of corruption. Extraction of recovered data can be done at original or new location accordingly. One can scan corrupt backup file & preview the recovered data, as option to extract data is disabled in free trial version. I was very worried with my lost data and the only hope to get back my data was this BKF file but things got worse when I found that this backup file too was damaged and was showing errors. Thankfully one of my colleagues suggested me this BKF Recovery tool and I was able to get back my data. I am very happy with the performance and speed of recovery. Thanks for developing such software. © Copyright 2014 - 2019 www.repairbkf.net | All Rights are Reserved.